Constitution of May 3, 1791 (Polish: Konstytucja Trzeciego Maja; Lithuanian: Gegužės trečiosios konstitucija) is generally regarded as Europe's first and the world's second modern codified national constitution, following the 1788 ratification of the United States Constitution (however, see also: Corsican Constitution). The May 3, 1791, Constitution was adopted as a "Government Act" (Polish: Ustawa rządowa) on that date by the Sejm (parliament) of the Polish–Lithuanian Commonwealth. It was in effect for only a year, until the Russo-Polish War of 1792. National Independence Day (Polish: Narodowe Święto Niepodległości) is a public holiday in Poland celebrated every year on 11 November to commemorate the anniversary of Poland's assumption of independent statehood in 1918 after 123 years of partition by Russia, Prussia and Austria. 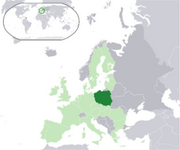 The foundation of the Second Polish Republic is considered a key event by many Poles.